The Order of the Ancient Nobility of the Four Emperors - Founded by Emperor Henry VII in 1308 under the Patronage of the Guardian Angel. Its object was the Defense of the Faith. It was reserved for members of the Nobility and higher clergy, and was held in great esteem. 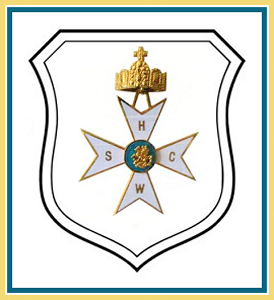 The eight-pointed cross is covered with white enamel and in the light blue medallion is a gold representation of St George on his horse, fighting a golden dragon. On the arms are written the letters “H-S-W-C” in gold, in honour of the four Emperors. The ribbbon is grey-blue with yellow borders. 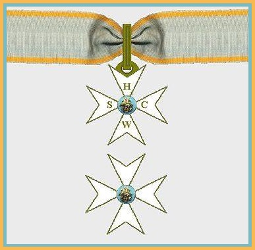 Grand Cross - Order of the Ancient Nobility of the Four Emperors. Commander - Order of the Ancient Nobility of the Four Emperors. Knight - Order of the Ancient Nobility of the Four Emperors. Defense of the Holy Catholic Faith. 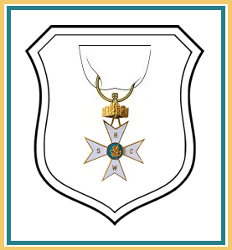 The present status of the Order of the Ancient Nobility of the Four Emperors, is that of a Holy Chivalric Order of the Holy Roman Empire, as such all Rights, Patrimony and Property (including the usage of all Armorial Bearings, Signs and Symbols), of the Order of the Ancient Nobility of the Four Emperors, come under the exclusive ownership and protection of the Holy Roman Empire Association - ASSOCIAZIONI dei NOBILI del SACRO ROMANO IMPERO. The Present Nominal Grand Master of the Order of the Ancient Nobility of the Four Emperors is the Chancellor of the Holy Roman Empire Association. Copyright (C) The Holy Roman Empire Association, hold full International Copyright to the Order of the Ancient Nobility of the Four Emperors. Copyright Held 2016 - All Rights Reserved Protected by European, U.S. and International Copyright Laws.